A walled city with many spires and gabled buildings recedes from right to left beside a frozen river bustling with skaters and two elaborately carved, horse-drawn sleighs. Some skaters whiz along singly or in tandem while one poles himself laboriously forward in a sledge and another has taken an embarrassing tumble. At the back left is the silhouette of a drawbridge and tiny travellers on a road. Overhead the sky features icy haze and billowing clouds. Particularly beautiful are the passages of cool pink and lemony yellow in the winter sky. In 1627, very early in his career, Salomon van Ruysdael painted three winter scenes that are clearly influenced by Esaias van de Velde, who though undocumented as his teacher informed his first manner. Subsequently Salomon painted numerous dunescapes, river landscapes and marines in the 1630s and 40s, but did not return to winter subjects until the early 1650s. In paintings dated 1653 and thereafter he again took up the diagonal designs that he had developed in river landscapes more than twenty years earlier but now applied them to skating scenes on frozen rivers beside cities; although some of the latter are vaguely identifiable as scenes of Arnhem1 most are imaginary, as probably is the present city view. 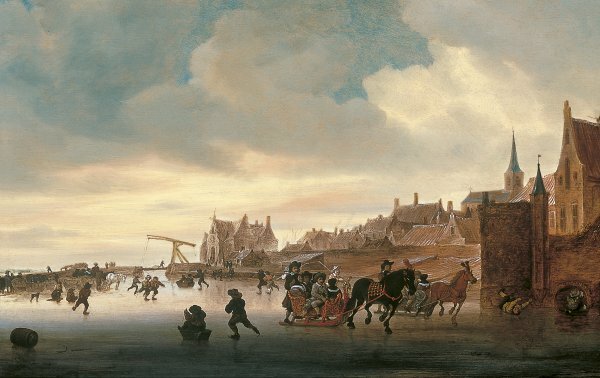 The composition as well as individual motifs in this painting seem to reflect the influence of Jan van Goyen's designs for skating scenes from 1638 and thereafter. However Salomon employs a much more colourful palette, his figures (still in the tradition of Esaias van de Velde) are more solidly conceived yet supple and nimble, and his architecture more substantial and insistent. The skies in his winter scenes are also far more varied meteorologically than Van Goyen's leaden heavens or the glowerings of his celebrated nephew, Jacob van Ruisdael. The latter's paintings of winter's darker moods held no interest whatsoever for Salomon. Rather it is the gaiety embodied not only in the colourful atmosphere but also in the wonderfully frivolous decorations of his beloved sleighs (see their counterparts in the Arnhem views mentioned above) drawn by steeds with fanciful harnesses and feathered bridles that sets the light and festive mood. 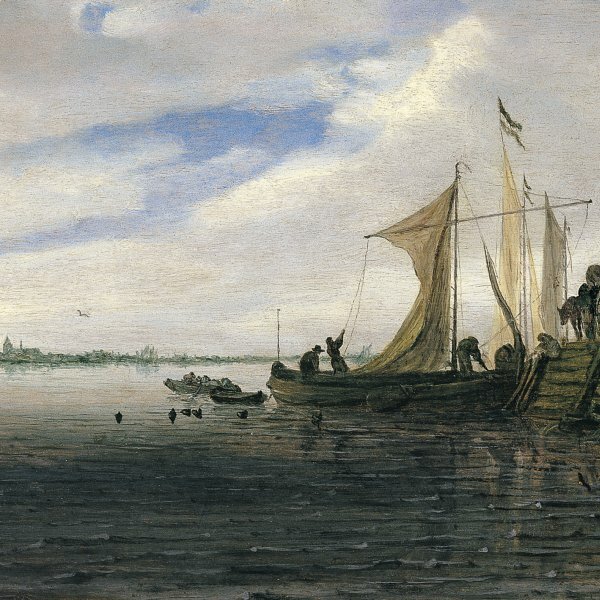 Houbraken observed that Salomon often began his paintings by dragging a broad brush across the scene, which explains how he created the windswept effects at the horizons of his landscapes. We also may enjoy in the present work his bold practice of painting "wet into wet", as he articulated the shapes of rooftops and other forms silhouetted against the sky. Stechow's only comment on the dating of the painting was "spät" (late), implying correctly that it was executed about 1660 or later.